Just to say that it was a great pleasure to see Fordingbridge host the Hampshire U15 matches at The Rec today and I'm sure that Tony would have been very very proud of everything the Club has achieved and of the performance of the Fordingbridge U15 Hampshire players. Top fella , will always remember him accusing me of being a wimp for sleeping on tour. I am absolutely devastated to learn of the very untimely death of Tony.He was a fantastic leader,a tireless worker in all aspects for FRC,and a GREAT bloke! I had many a good laugh with him and I'll greatly miss him!! I'm sure everyone who is,and has been,associated with our great club feels the same.My deepest condolences and heartfelt sympathies go out to Chris and all of Tony's family,relations and friends. It was an honour to have played alongside such an exponent of the game. You will be missed Tony. Both Tony and I regarded the scrum as a work of art a thing of beauty ,that the rest of the game should not be allowed to spoil. I shall miss him greatly! I always remember Tony's enthusiasm and committment to the game and I send my sincere condoleances to his wife and family. We had a minutes silence at a recent U16's match, only just relaised who had passed away. What a massive shock and a great shame. Tony was a smashing guy and will, as has been said below, be deeply missed by his friends and family. Tony - it is very difficult to imagine Fordingbridge Rugby Club without you. Words like "iconic" are not wasted upon you and from a personal point of view, I have not played rugby with anyone who commanded a game, a team and indeed a club in the way that you did. I feel extraordinarily privileged to have played alongside you, spectated with you and appreciated your very special friendship. Your genial personality and wicked sense of humour will leave a lasting memory with us all - just as your charges from the base of a scrum did. Sincere condolences to Chris, Paul and Amy. Tony, a more welcoming club than the one you founded would be hard to find, generally, with you in the lead offering advice from the touchline or in the bar. It was an honour to know you, even for a short while, both as a businessman but foremost as a true rugby gent. An inspiration in my more recent playing times, I will never forget the call of 'come on lads' from the sideline! My memories also stretch back to mini's in the 80's and basket meals at the Load of Hay! Look forward to beer again someday! You will be sorely missed by all of us players! Sadly missed ,great send off not a dry eye in the place,legend ,glad to of known him,our love to all the family. I played with Tony at trojans in the 80's.What a nice chap and a memorable smile. Tony was a wonderful man who gave so much to the game and to the lives of those around him. I last saw Tony at the Club's 25th Anniversary Dinner and that was a brilliant evening and Tony was a great host. My thoughts are very much with his family and many many friends at this very sad time. Tony, you have been such a positive role model and influence on so many of us over the years. A shock to lose you, but are such a massive character, we will never forget you. You were such a hard worker, highly competitive, with a great sense of fun and outrageous laugh [and far to good looking for the front row] Your mustache drooping into the froth on a fresh pint of Ringwood in the Green Dragon after beating Trojans and more pints at the clubhouse to come, lots of stories and ribbing and laughing. Maybe evan a curry at the Raj of India before stumbling home. These are precious memories, priceless and treasured. A great player and a great guy who knew how to enjoy himself. I have nothing but happy memories of playing days together at Trojans. I am not often left speechless but watching Tony on the rampage did that to me.I was never slow but often left in the wake of a man smashing his way through the opposition with determination and virtual grace.As a self proclaimed brilliant player I have to admit he was damned good and a pleasure to have known,our thoughts are with his family. Tony, you were the epitome of everything that's good about rugby: friendship, enjoyment, larger than life characters and above all you were a gentleman in the true sense of the word. Your legacy is a clubhouse that feels like home from home to adults and youngsters alike. It was a pleasure and honour to have known you. A truly, madly, deeply, lovely guy - always welcoming, always gallant, ready to help and support where he could - all the FunQuest Trustees were so grateful for Versatiles's sponsorship of our fireworks. We'll remember him most for his huge smile. Our thoughts are with Christine, Paul and Amy. We played rugby together, we drank together, we organised together, we drank together, we cycled together, we drank together. There appears to be a recurring theme! I will miss your laugh and that large hand on my back propelling me through life. Please do "Mind the Trams!". What can we say about you Tony? You were truly the legend mentioned by so many. An honourable man, the heart and soul of every party who refused to give in to your illness, continuing to embrace life to the full. Your wicked grin, twinkle in the eye, incorrigible chuckle and sheer exuberance enhanced all our lives. Thank you Tony, we feel honoured to have been your friends and life will not be the same without you. With deepest sympathy, and many very fond memories of times spent at Trojans and the Load of Hay in Tony's company. A true Gentleman. FROM : David Croucher, John Barber and Roger Oakley. Before moving to Turkey three years ago I spent many great Saturday afternoons with Tony & friends at the Rec. It was a great shock to hear of his sudden death. He aways made you very welcome at the club and his stories and humour are legendary. He will be greatly missed but through his efforts he has left a wonderful legacy at FRUC. Our thoughts are with his family. Tony, i still can't get my head round the fact that i won't be seeing you down at the club again. Clare and I have been privilleged to spend a lot of time with you over the last 18months or so working on the dinner committee. During this time we had really gotten to know you very well and had become very fond of you. We have throughly enjoyed your's and Chris' company and you leave a big void in so many peoples lives. Tony you were an absolute legend and we loved you very much. Sleep well big man. Great shock,Tony was Fordingbridge rugby Club always helpful,when I started playing rugby his advise was a great help. Thankyou Tony God bless. Sadly missed, a great, great man. I met Tony on the 'Basque Challenge', a team cycle ride across France from St Malo to Biarritz, in 1997. My team and his were of similar vintage and we ended up 'competing' on the road and again in the bar at the overnight stops. He had a wicked sense of humour and we ended up spending most of the 30-hour return ferry journey in the ships bar for re-hydration. I completed ten challenges in all and Tony was always there, larger than life and wholehearted in everything he was involved in. A sad loss. Tony was a great man and there were many reasons why I loved being around him. His razor sharp wit, honesty, integrity, consistency, his views on people and on life and his love of rugby! He left those around him better off for his presence and it has been a massive privilege to have known him and enjoyed his company over the years. At the rugby club we all loved and respected him hugely. His legacy will live on for many years because he inspired many generations of players - and he will long live on with us all at the club - as a legend! I still cannot believe he has gone, during yesterday's game I felt he was with us, urging us on with his customary "come on lads' chat from the touchline. He would have loved the win, 4 tries - 2 from the forwards and 2 from the backs - and the physicality of our dominance - particularly in the second half. I know he was proud and excited by the progress of the squad and that we were proving to be more than living with the competition at London 3 level. Yesterdays game only went to reinforce that. He was there in spirit, just as he had been a week ago, in person. I will remember him in many ways and with many mental images from the years gone by. However, inevitably - of the many - it is those from last saturday that will probably last the longest. On that day, his last, he looked truly and deeply happy. At the club he was in "full-on' Tony form, loving the home win against Ellingham and Ringwood, and as our eyes met across the length of the bar he gave me a huge wink, a thumbs up, and that huge, unique, Tony grin. There was a typically laser like twinkle in his eyes - he was ecstatic. Later on, at The George, as he left with Chris, I felt the same emotion - he struck me as a very happy man. I feel privileged to have seen him then and to have that memory to treasure. will be missed but i am proud to play for the club he formed. I had the privilege of playing rugby and cricket with Tony at King Edward VI School Southampton.A sporting frienship that lastted for years. There was always a pint for me at Fordingbridge and a pint for Tony at Romsey. Sadly missed but not forgotten. Very sad to hear of Tony's passing. Tough, funny, well respected and most of all great company. 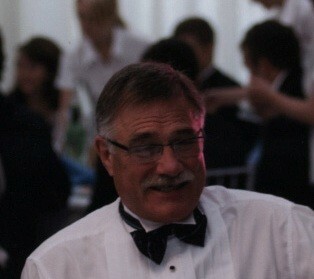 Andover RFC would like pass on condolences to Tony's family and to your club after hearing of the sad passing of Tony. There are quite a few guys here who remember him from his Trojan days. "Rocky" The passing of a legend. From the first time I walked into the Load of Hay and saw you, you made a lasting impression on me. I'm sure everyone who knew you feels the same. My years of playing rugby alongside you are constantly in my thoughts. That dirty, dirty laugh of yours will remain with me forever. So many stories, so much fun. I will sink a few in your honor tonight. What a great guy. Christine, Paul and Amy. My thoughts are with you. All the members of Ellingham and Ringwood RFC were saddened to hear of the death of Tony O'Connell.He played for ERRFC for a number of years before Fordingbridge was founded and so is well-remebered as both a colleague and opponent.He was a fantasti anbassador for for Fordingbridge RFC and the game at large, and they simply don't make them like him any more. A super rugby player and a lovely man, he will be greatly missed. Our condolences go out to his family and all his fellow club members. Shocked to the core like everyone else but my secret hope is you are enjoying a beer with Brian. I have great memories of a "larger than life" character both on and off the field. You will be sorely missed and my thoughts are with Chris, Paul and Amy. You were a legend Tony. I still can't believe that I won't see you and hear your famous laugh when I next visit the Fordingbridge clubhouse. Only you could have planned your last day with a win against Ellingham & Ringwood and England beating Wales at Twickenham! My thoughts are with your family and all of your friends. I can still hardly believe the terrible news of Tony's passing. My memories of him are legion, as host of the Load of Hay, as player and coach at the club, and as a friend. A tough but fair man on the field, and great, jovial company off it. One of life's larger-than-life characters, he leaves a wealth of fond memories. Thanks to him for all the help and encouragement in getting me started in rugby. Deepest sympathy to Christine and family, friends and those at Fordingbridge RFC. FROM : Roger Holden, OYUS, Oulu, Finland. I am writing in my capacity as Chairman of Eastleigh RFC to express our great sadness on learning of Tony's death. Many of us encountered Tony through games against the Trojan Club many years ago and I also have particular memories of his kindness when I refereed at Fordingbridge in the early days of your Club. Please would you convey our condolences to both Tony's family and members of Fordingbridge RFC. Just heard the news about Tony. I am shocked and saddened. My thoughts are with his family and friends. I am so glad I managed to have a quick chat with him before yesterdays game. My last memory was seeing him, in his 'No. 1s', at the bar smiling. A good player and a great man. Thank you, Tony. Very sad to hear the news about Tony. Although i never knew him well he was always a great person to speak to after any game and always had a smile on his face. It was truely a pleasure to have known such a gent and a great ambasador for Fordingbridge Rugby club and Rugby in general. Sums up what the game's about. There is much to remember and much to be thankful for as we remember Tony and the way he shared his life with those around him. Each of us gives gifts of ourselves to those we share life with. These are gifts that no one can take away. Though we are gone, these gifts remain with those to whom we have given them.